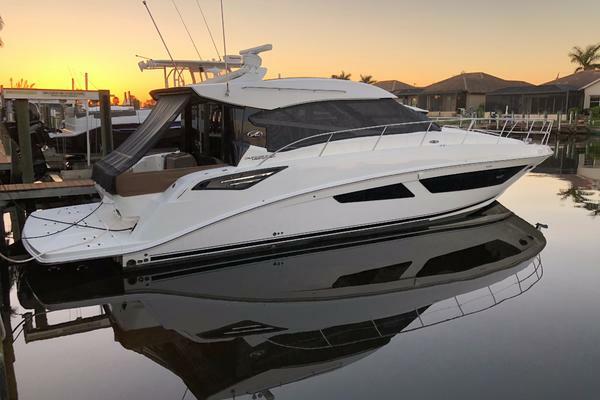 2014 Spencer Yachts 44 Express Sportfish. Twin Volvo IPS600 435 hp Pod Drives, Palm Beach Style Controls With Joy Stick. Westerbeke 8 KW Generator. Master Stateroom Forward With Pedestal Style Berth. Guest Stateroom Located Aft With Two (2) Large Double Berths Aft. An Exceptional Spencer Yachts Express Ready For Fishing, Cruising And Sleep Aboard for Travelling And Family Fun. Owner's personal effects, fishing rods, reels, tackle, gear, tools and tool chest, life raft and EPIRB are not included in this sale and will not convey with Vessel at Closing.